The REVIT Stratos Gore-Tex Gloves don’t just elevate the standards for ergonomics and cold weather comfort - they take 'em into the stratosphere. Most notable of the standout features of these innovative winter gloves are the unique Seesoft 3D formed knuckle protectors and the convenient single-motion gauntlet closures. The REVIT Stratos Gloves use a steadfast Gore-Tex waterproof membrane, Thinsulate G insulation and a tri-fleece liner to keep your hands cozy. 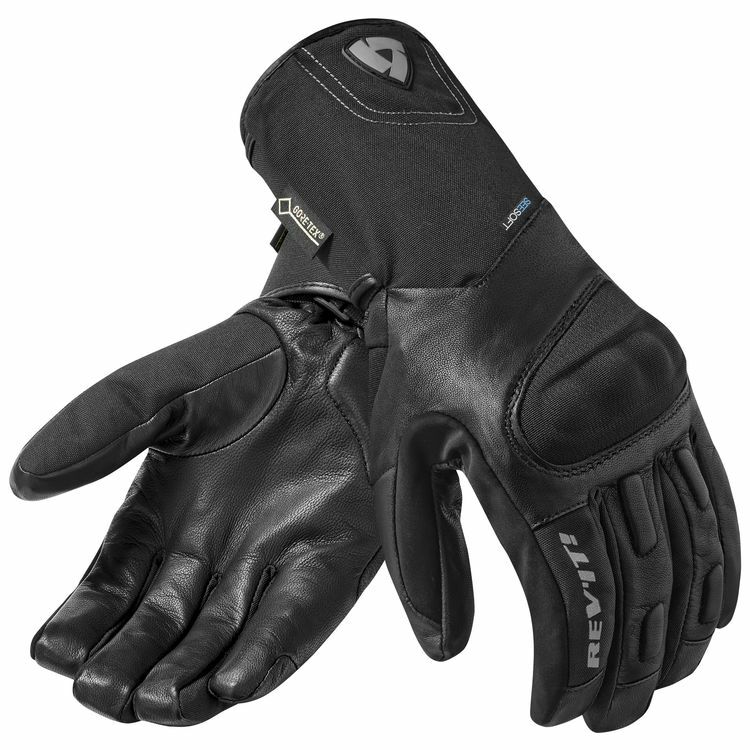 The goatskin palm of the REVIT Stratos Gloves use wraparound finger tips to minimize uncomfortable seams and joins with the polyamide textile to create a formidable, functional winter glove that won’t let you down. These gloves do a great job of cutting the wind out of your hands and insulating them. They feel a lot like snowboarding gloves, so the touch isn't as precise as a pair of standard leather gloves, but I can't imagine any glove with insulation being any better. The securing method on the cuff is pretty ingenious, especially since it is hard to use your fingers. Getting the gloves on and off is easy. Temp range: I wear these gloves down to around 40 degrees at highway speeds with no hand guards and they've worked fine. I would imagine they coudl go a bit colder, but I don't know. I have also worn them in 60 and they were a bit too warm, but not unbearable. 3XL and still too small!!!!! I usually wear XL or 2XL. My hand measures 9.25" so XL should have fit. Ordered 2XL which was way too tight with short fingers. Returned those for 3XL and received size XYL, so who knows what size I received! Still way too tight and fingers too short. 4XL out of stock, so appears I am out of luck! Good luck on sizing these gloves! I have used this gloves for a month now and I commute at 5am every morning in sf for 1 hour. This gloves have been more than great for the time to the low 40s and the high 70s. The only concern for me is that I have fairly big hands and I use Xl most of the time but with this if I get XXL they are too big and XL is just a little too tight on by the nails that it hurts at time for the long ride, but if I loosen them a little they are perfect but again they are loose. Overall great buy, will recommend. Great looking gloves. Workmanship is nice. They do a great job of keeping your hands warm down to the low 40s for sure. Keep in mind if your core isn't warm the best gloves in the world won't keep your hands warm. That cold blood will circulate to your fingers and they will be just as cold as the rest of you. I have large hands, and while I love manufacturers like Alpine Stars, I just can't find a glove that fits in their line. Well I upgraded to these gloves for winter riding in LA (I know, that's not REAL winter) where it can get down in the 30s or lower at night. I just did the virgin run (early morning at around 43 degrees) and my hands were toasty warm. I ride a naked bike, so these were right out there taking the brunt of the cold air. I did not have the slightest feeling of coldness, even at the finger tips. As for fit, they are true to size, and accommodate thicker fingers. They are also very comfortable, while still providing enough protection. Highly recommend! Finally caved on a colder weather oriented glove for commuting sub 50 degrees. My daily is a FZ with no heated grips so the first thing to get cold is undoubtedly my fingers. First 5 rides on this glove were low 40's for 35 minutes in the AM and 60's in the PM and my hands were never cold. Haven't had a chance to test them in the wet. Comfy on the grips, comfy overtop of the sleeve of my jackets. Gripes: The thumb is bulky (to me) making operating the signals/horns suboptimal. The closure system isn't as adjustable as I would have hoped for and seems more style over substance but the gloves remain in place regardless. I purchased these gloves to replace a 16 year old pair of Held Gore-Tex gloves that finally gave up. After some research through videos and customer reviews I decided to give these a try. I wear a medium in most gloves and like a tight fitting glove. Went with the size 8 and the fit is perfect. These are really comfortable gloves. I live in NH and temps can drop quickly once the sun drops and with fingers that become unusable when the cold sets in I really need a glove that's warm. My 1st ride with these proved they would keep my hands warm as the temps dropped to 40F and I had a 40 minute back road ride home from work with plenty of cold cross winds and a mist in the air enough to require a routine wipe of the helmets shield. By the time I reached my hoe the temp dropped to 37F. I don't have heated grips and my hands were warm throughout the ride. Noticeably warmer than the cold weather Held glove I had been use to. I am sure I can go into much colder tempatures with these and have warm happy hands. As for features, the unique wrist closure feature is pretty cool and I needed to review the Revzilla video to figure out exactly how this worked. Hopefully these will last as long as my last pair of Gore-tex gloves and glad they are about 100 bucks cheaper than the comparable Held gloves. As for Held, They do make a great glove and I also bought a pair of the Air & Dry 2 in 1 gloves which are awesome warmer weather gloves. I have summer Revit Neutron 2 gloves, they are ok overall but in size medium are almost too small and my hands get tired after a while and numb. Left and right are different, unless my hands are different. So I wasn't happy with medium and ordered large Stratos GTX for cold weather. After wearing them on two rides I see they are too large and awkward and I have very poor control over throttle and clutch because of the sizing issue. So it looks like Revi't gloves don't work for me at all with their weird sizing. I know there is no such thing as the perfect winter glove I have been riding all year for 29 years. I got these for temp in the range 40F-60F where I think non-heated gear should perform best. I have had a lot of winter gloves with varying success. I now usually only buy RevIt as the XL fit my hands the best i.e. I have RevIT Dirt gloves for summer - very good and have other 3 season RevIt gloves in the past that were very good but wore out. I got these last Friday and this past weekend I rode from Boston to Catskills, NY for a weekend tour covering ~700 miles. Temps were in 55- 75F range. No break in required. These gloves felt cold under 58F. My hands were not warm and I was riding a VStrom with hand guards. At the top of mountains I could feel the cold creeping in. 2. Liner pulls when taking them off. 3. And as others have noted the single-motion guantlet closure is a pain and to me a gimmick -it has a velcro closure what more do you need! 1. waterproof. At least in the constant drizzle I had riding 4 hrs back home. 2. Tactility: standard for a winter glove. Warm, comfortable, Gore-Tex. These have been pretty good for my winter commute, all the way down to about 28 degrees (with heated grips). superior protection and winds stopping. perfect fit. clean look. You guys talked me into it. Well done. Now, high expectations. reviewed multiple sites and video on separate products. great breakdown on revzilla product video to help decision making & sizing. They really are waterproof. I like them. I wanted a pair of waterproof gloves as I ride in the PNW. Sadly, these got soaked the first day I wore them. They do keep your hands warm even when wet, but they're certainly not waterproof. Otherwise, they're super comfortable on long cold rides. Cold weather coming in and we do a lot of Mardi-Gras Float movement Escorts and the past few times I used snow-mibile gloves to keep me warm. They kinda did the job but the HI VIZ non-gortex had some challeges with my uniform .. I'm hoping that these gloves do the trick. I needed a multi-season, waterproof glove that I can wear with heated liners when it gets cold; and this glove is not very expensive. Heard a lot of good reviews for this glove. Time will tell if they were right. they look awesome and should do the trick in a 3 season cold weather town like Bergen, Norway! What temperature will these gloves protect to? BEST ANSWER: It really depends on your body, as per my review I just posted, today was 33F and I was still "warm" (basically as cold as your hand would get if it was mid 60's with no gloves). I don't think you'd find a better glove for the money. It was about 46~48F today, I rode on freeway going about 85-90 for 20-25 minutes and my hands were not cold at all. Hello, when will this glove be available? Are this gloves good for hot wearher? BEST ANSWER: Haven't tried them in warm weather riding yet, just got them in November, but they were actually hot when I tried them on in the house--I would not recommend them for riding above 60 degrees. Does the index finger have the tech touch material? No you can't use these gloves with your phone. Yes and it actually works. Comfortable glove. The ones I just bought do not! Does the left hand have a squeegee? BEST ANSWER: Both gloves have a wiping material (feels kind of like felt) that goes along the entirety of the pointer finger and thumb. Yes. Both the left and right hands have squeegees. No, just a wiping insert. Are they a good glove to wear with heated grips? BEST ANSWER: Yes, worked perfectly with heated grips on my R1200RS. Great pair of gloves, highly recommend. I agree, they work well with the heated grips on my R1100R. I have long fingers. The XL fit my wrists just fine, but the fingers were tight and to short. What size would you suggest to try next? BEST ANSWER: I bought a xxl. I have thin hands and long fingers and they fit great. What's the closest to these gloves for women?